You have an X-cycle - both the options for 5, the green 5's and the purple 5's, eliminate the yellow 5. If it is a 9, other empty cells in the same row are respectively 6 and 8. Then last two empty cells of the second row are respectively 9 and 3. Fifth cell of the second row is then an 8. Therefore in either case, there is no 8 in the first two empty cells of the second row. 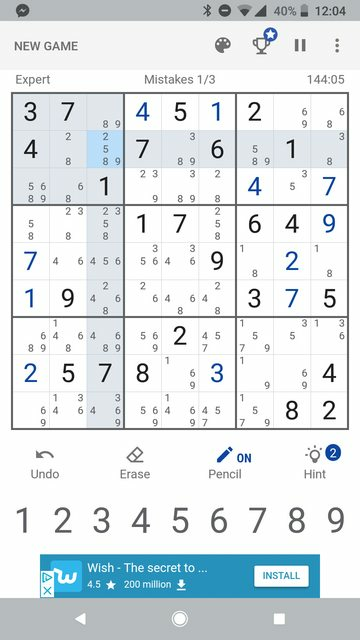 First empty cell of the second row is then a 2. 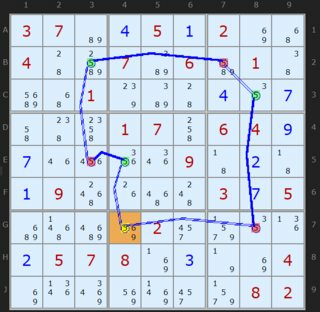 If it is a 6, there is a 5 in the highlighted cell (the blue one in the top-left region). Then there is a 4 in the second empty cell of the middle line. Therefore in either case, there is no 4 in the central cell (middle region), or in the first empty cell of the sixth line.